Mindfire has most professional Joomla Development India team which has executed over 60 projects in the domain over the last 8 years. We build applications which best suit our customer’s budget and business interests. Our Joomla Development team is your one-stop solution for all your Joomla needs. Starting from minor customizations to Joomla components to setting up an updated Joomla Content management system, Mindfire’s seasoned Joomla programmers does it all. This minimizes the cost of maintenance of the systems. In addition, Mindfire enables customers to reduce their time to market because of inherent expertise in the team. Mindfire’s team of Joomla programmers have rich experience in Joomla customization, custom Joomla CMS design and Custom Joomla Website development. We describe some of these Joomla Development project experiences below, and will be glad to share our expertise in detail with you. We have been in business of custom software development for 17 years and we are a specialist in Small Team Software Development by following Agile Methods. We provide a range of services in Joomla thanks to the years of experience in web application development and custom CMS development domain. Here are the services that we provide from our engineering centers in India. Joomla is an open source Content Management System (CMS) that helps in building websites and web applications. The flexibility comes from add – on modules provided which can be easily installed as and when required. oomla features acquainted by web applications are available as Plug-in modules and extensions. Few of the powerful-Plug-ins and extensions available from the open source community are listed below. As an Joomla Development company, Mindfire Solutions has worked on and delivered various applications, systems, and software with Joomla and other associated technologies. To view some of our Joomla Development India solutions, please visit our Projects page. 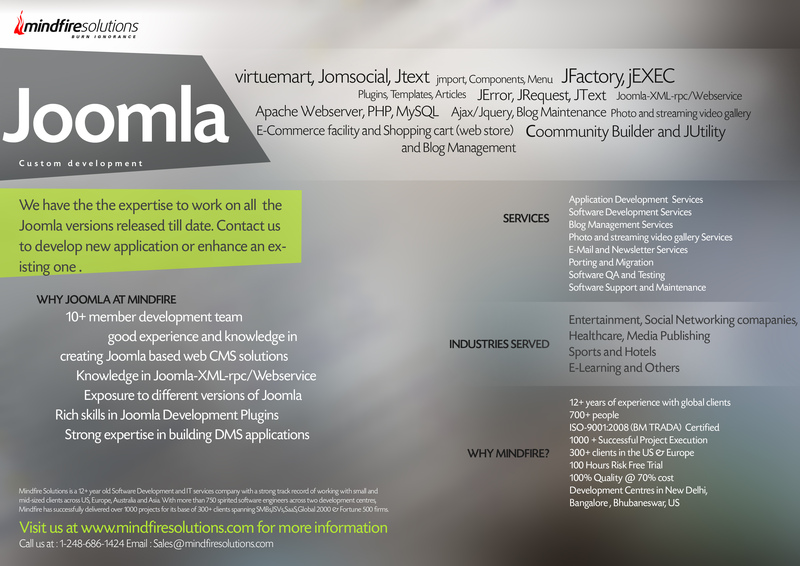 Here are some examples of the applications that we have developed with Joomla. Our Joomla developers team have provided cutting edge solutions to clients in the below mentioned industries and have gained significant appreciation for their expertise. We have worked on Joomla Development projects across various industries as given below. "Mindfire has enabled us to reduce costs and increase productivity. The team we have provides fast and reliable development support. We are very happy with the level of service from Mindfire." - Ken Morency, IceFire Studios Corp.